JosephEWorcester is a Legacy Library. Legacy libraries are the personal libraries of famous readers, entered by LibraryThing members from the Legacy Libraries group. » Joseph E. Worcester's catalog. » Joseph E. Worcester's legacy profile. JosephEWorcester is also an author. » See Joseph Emerson Worcester's author page. Worcester and Webster are names that group themselves together in the public mind, so it seems natural that they should follow each other in this volume, But they were far from being warm friends. Their temperaments and attitudes of mind were very different. Webster did his work with the great public and its judgments always in mind. He wanted to influence the nation. Worcester was a more modest and retiring scholar. Webster tried to change the language to conform to his ideals of what was right. Worcester was satisfied to exhibit the mother tongue as it was (323). The conflict between Worcester and Webster developed into what is known as "The Dictionary Wars." You can read about this conflict in Jerry Morris's blog post, Some Worcester Sources and Other Discourses Concerning the Dictionary Wars. Before becoming a lexicographer, Worcester (pronounced Wuss-tur) was a teacher and then ran a school himself for a few years. Nathaniel Hawthorne was one of his pupils. Worcester's first published work was a Geographical Dictionary published in 1817. His first English Dictionary was a Johnson's and Todd's Dictionary, which he edited in 1827 (some say 1828, but Worcester listed 1827 as the year it was first published). Worcester was compiling his own dictionary in 1829 but put it aside to abridge Webster's 1828 Dictionary in 1829 (Webster had refused to make the abridgement). Worcester published his own Comprehensive Pronouncing and Explanatory Dictionary in 1830, which was more popular than Webster's 1828 Dictionary and brought about the Dictionary Wars. 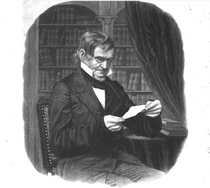 Worcester's best dictionary was his 1860 Dictionary of the English Language. The cataloging of the books listed in the Harvard College Donation Ledger 1866 is complete. The cataloging of the books listed in the Catalogue of Joseph E. Worcester's Library 1865 is in progress. Worcester's library itself is rich in Americana, religious works, and philological works. The 255 books donated to Harvard are not listed in the catalogue of Worcester's personal library. This catalogue, containing 1395 volumes, was compiled by a relative after Worcester's death in 1865. It lists the titles of the books as they appeared on the spines of the books. Identification of the books based solely on the titles on the spines was difficult. And identification of the editions was practically impossible; therefore, almost all entries contain the phrase "edition unknown." Moreover, there were many books that were impossible to identify, and these are listed in "Unidentified items."